Binding Store has had a fantastic two weeks launching the new Renz Comfort Plus’s. These machines have challenged the original comfort models with a new and improved punching speed from its new motor, making it twice as powerful! 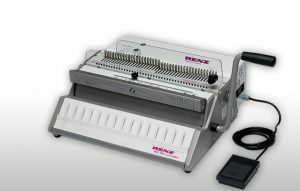 The Renz Comfort Plus machines will replace the ERW, E and original comforts, making it an simple and quality solution to all of your binding needs. We sold our first Comfort Plus last week to one of our favourite customers, The Lazurus Partnership who specialise in independent research. Currently, the Lazarus Partnership create professional presentation documents for their clients, making their machine an integral part of their day to day tasks. Since receiving the machine last week, Lazarus are delighted with the new machine. We are pleased to announce that the Eco, SRW and Combi ComfortPlus’s are now available on a free next day courier service – With every machine you buy, we will give you 3 boxes of free wire or Combs to get you up and running!